I think things just got sparky, a term I once heard a military figure use to denote a battle that has both commenced and turned hot. In her interview in The Atlantic, with Jeffrey Goldberg, Hillary Clinton sounded as burly and hawkish on foreign policy as John McCain. That’s not a surprise to longtime Hillary observers, though that she chose to declare it so uncompromisingly at so early a point in the 2016 presidential cycle, is. Mrs. Clinton came into politics from the McGovern wing of her party, but that was long ago. She has been more publicly hawkish since she ran for the U.S. Senate in New York in 2000 and 9/11 happened a year later. She famously voted for the Iraq war, which opened up running room for a young man named Barack Obama. Everyone knew that Mrs. Clinton would have to detach herself politically from Mr. Obama, an increasingly unpopular president. But she was his secretary of state for four years, so the distancing would have to be done with some deftness and delicacy, and deeper into the election cycle, not now. Instead, it was done with blunt force. In the interview Mrs. Clinton went square at the president’s foreign-policy vision, or lack of it. “Great nations need organizing principles, and ‘Don’t do stupid stuff,’ is not an organizing principle.” This is both true and well stated, but it is remarkable to hear it from, again, a person who until February 2013 was his secretary of state, presumably an intimate and part of the creation of his foreign policy. Just as remarkable, by throwing down this gauntlet Mrs. Clinton starts an argument within her party that might have been inevitable but certainly could have been delayed and, with pleas for unity, softened. By starting the argument now she gives time, space and reason for a progressive Democratic opponent to arise. The 2016 Democratic presidential cycle has begun with this interview and has begun early. The tone and content of Mrs. Clinton’s remarks seem to assume a Democratic Party base that is or will prove to be in broad agreement with her hawkishness. But is that the feeling of a major portion of the Democratic Party base right now? 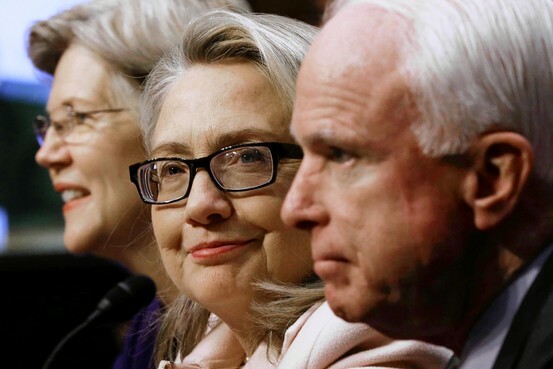 Secretary of State Hillary Rodham Clinton sits between Senate Foreign Relations Chairman Sen. John McCain, R-Ariz., right, and Sen. Elizabeth Warren, D-Mass., in 2013. You can see the progressive pushback in David Axelrod’s remarks when he took to Twitter to remind Mrs. Clinton that stupid stuff “means stuff like occupying Iraq in the first place, which was a tragically bad decision.” The Obama White House is reportedly angered by Mrs. Clinton’s remarks. Left-wing websites have taken issue with her. Mrs. Clinton was always going to have a challenger or challengers for the party’s nomination, and in fact needed one: She needs someone to beat for the nomination, she can’t just glide to it. At the same time it was in her interest to own a lot of political ground and give no big stark issue to the left. But she’s given them one now, and she is probably going to get a bigger challenge than she thinks. Who might it be? Democrats are suddenly full of names—that itself is significant, they weren’t a few weeks ago—but the first person who always comes to mind could cause Mrs. Clinton a lot of trouble. In a smart piece in The Washington Monthly, writer David Paul Kuhn takes a look at Massachusetts Sen. Elizabeth Warren and reminds the political class not to write her off and not to assume that her stated position up to now—that she does not intend to run for president—will hold. Mr. Kuhn notes that Ms. Warren has a powerful appeal among the party’s activist left. Her rhetoric is pure firebrand: “The game is rigged . . . and the rich and powerful have lobbyists and lawyers and plenty of friends in Congress.” She draws big, enthusiastic crowds. Mr. Kuhn quotes Democratic campaign veteran Joe Trippi, who suggests things may be more dynamic than they look: “The progressive wing is looking for a candidate.” With Hillary, as they say, Democrats are falling in line but not in love. Yes, Mrs. Clinton is the favorite; yes, she has the money, the clout, the stature, fame and relationships. But she’s no populist, and populism is rising. Hillary is close to Wall Street; they’re her friends, her donors, they hire her for big ticket appearances. Ms. Warren has no use for Wall Street; they’re the ones who crashed the economy and got away with it. Mr. Kuhn notes that Ms. Warren’s signature line—the game is rigged—is no longer radical; it is the view of 6 in 10 Americans in some polls that our economic system unfairly favors the wealthy. Ms. Warren would also take Hillary’s most powerful argument—that it’s time for a woman president and she is an accomplished woman—off the table. One is that Ms. Warren has the hard-to-quantify power of the person who means it. She’s a real leftist, she didn’t get it from a poll. Second, though Ms. Warren and Hillary are almost the same age (65 and 66, respectively) they represent two wholly different political experiences. They are of different Democratic generations. Hillary is a post-Reagan liberal. Her generation of liberalism was defined by a reckoning with and accommodation to popular modern conservatism. Ms. Warren is a post-crash progressive. She came to politics during and after the financial crisis of 2008, and her political message was shaped by it. To some in the base Ms. Warren may seem fresher, more pertinent. As for her repeated statements that she does not plan to run for the presidency in 2016, Mr. Kuhn notes that Barack Obama said things like that in the years before 2008. Then he ran. On the Republican side, of course, no one’s certain who’s running; some of those who think they might won’t, some who think they won’t might. But, as a smart party veteran said the other day, the primaries could in time turn into Rand Paul Versus the Guy Who Isn’t Rand Paul, the guy who stands for a greater perceived moderation. But what if the nominee were Rand Paul? And he went up against Mrs. Clinton? The Kentucky senator would, presumably, be to her left on foreign policy. That would be historic enough. But what would the GOP’s establishmentarians, its money men and opinion shapers, do if the 2016 election came down to Mr. Paul versus a more moderate-seeming Hillary? They just might choose Mrs. Clinton. Bolt the party, or sit this one out. We could see a rising populist candidate pretty much split the Democratic Party this year, and a rising libertarian one pretty much split the Republicans. Yes, we are getting ahead of ourselves. No, this is not where you’d put your money, in part because it’s too dramatic, and when you expect history to get dramatic it often doesn’t, just as when you don’t it sometimes does. But only months ago people were thinking 2016 might be ho-hum, a Bush versus a Clinton, with mournful commentary about the decadence of America’s acceptance of political dynasties. Maybe it will be sparkier than that. And maybe the sparkiness began this week, with that interview in The Atlantic.